Today was about moving forward and ensuring that the future is better and more useful and effective than anything now or in the past. A refinement, if you will. That said, my day began early with the 8:30 session PVLR (Publisher/Vendor/Library Relations) Interest Group Forum that focused on the topic of enhance ebooks. This is of great interest to me since I catalog ebooks, and have seen a few “enhanced” with links out to other material but that’s it as far as enhanced. Jake Zarnegar from Silverchair Information Systems gave the most comprehensive explanation of the myriad of different types and levels of ebooks, along with the some challenges and benefits. Susie Stroud from Credo Reference demoed their enhanced ebooks, which are more like interactive websites with immediately playable embedded videos and interlinking to other relevant articles and research materials. It’s a great way to think about content and the learners, meeting them where they are and chunking the information up (you’ll see the next tie-in shortly!). Nancy Gibbs from Duke University Library focused on the challenges of faculty by-in and how hard it is to get the library involved. On her campus, different professors created one-off ebooks solely for a class. One professor had the grad students create the content to be bundled at the end as an ebook but then the professor merely deleted it at the end of the semester, finding no future value in it and wanting the next year to do their own, possibly on a different topic. Even for just preservation reasons if nothing else, how can they convince a faculty member to involve the library to save a copy if the professor himself doesn’t value the end result of the students creating an enhanced ebook? It’s tragic but if they create the project on their own and don’t include the library, it’s a huge hurdle to get involved later on in the process, or at the end; this is something to work on. Andrea Twiss-Brooks from the University of Chicago science libraries discussed more of the hurdles with enhanced ebooks, concerning use, pricing, and support. Ebook apps, while a great idea and cool, aren’t sustainable for libraries and check-out or reserve shelf, etc. Questions around ILL, upkeep, cataloging, and acquisitions were also discussed. While it brought up more thinking points than it resolved, this session truly stimulated the room and myself into considering what is out there, what’s to come, and what do we do about it? My final session of ALA was Taking a New Look at Training and Learning that centered around small group discussion that filtered back into the larger group. People from Web Junction facilitated the event and kept an agenda and plan going to keep us in the time limits. But with all the great ideas and comments, the time literally flew by, with most of us wanting to continue on talking. What do learners need? What motivates people? How do we apply these lessons to training to better serve the learners? Despite not teaching or supervising in my cataloging role, I have taken webinars for software and helped teach my grandparents and parents about the iPad, and my uncle about his Windows laptop. From these experiences, I could relate and project these take aways into future situations to ensure the best learning environment for me or others. I dropped into this session last minute and loved it, learning a lot too. That’s what ALA is great for an can be really fun–stepping outside your usual bounds and seeing what you can learn and apply later. Ideas abound! Lastly, I walked the exhibit hall one last time. Besides following Steve around on his booth business, I peeled away to explore on my own. One of the best stops was at the LC booth. At the RDA update, Beecher Wiggins discussed the training that they are wrapping up for all of their staff, including overseas. At the Learning session, one lady asked me about assessment tools for those RDA modules online–yes, she was a cataloger too! I didn’t know but thought it a great questions so I headed over to LC to get an answer. No one there could give me one at that point so they put me in touch with a couple of people in their training office, so hopefully in the next week or so I’ll hear back from them. Being able to talk in person can really get the ball rolling, if not work things out. 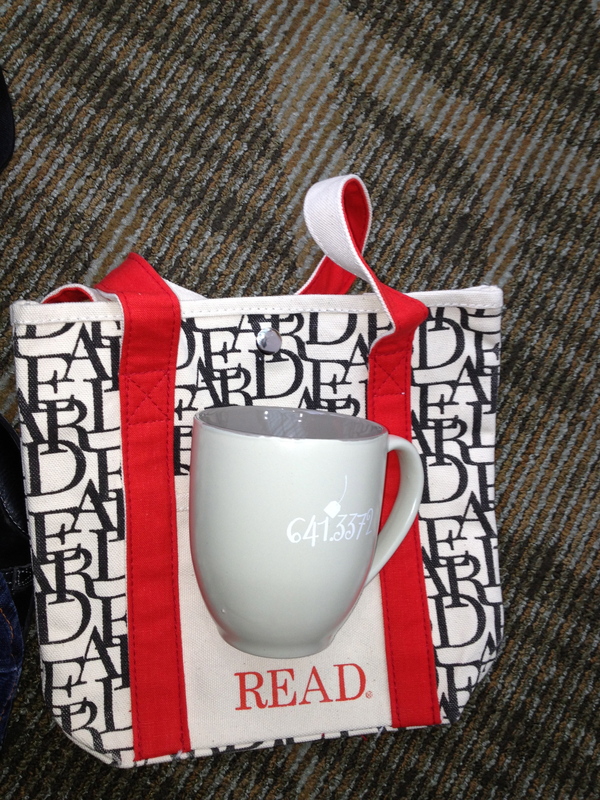 And since I avoided all of the swag, I just couldn’t resist those darn cute mini read tote bags and a call number tea mug! 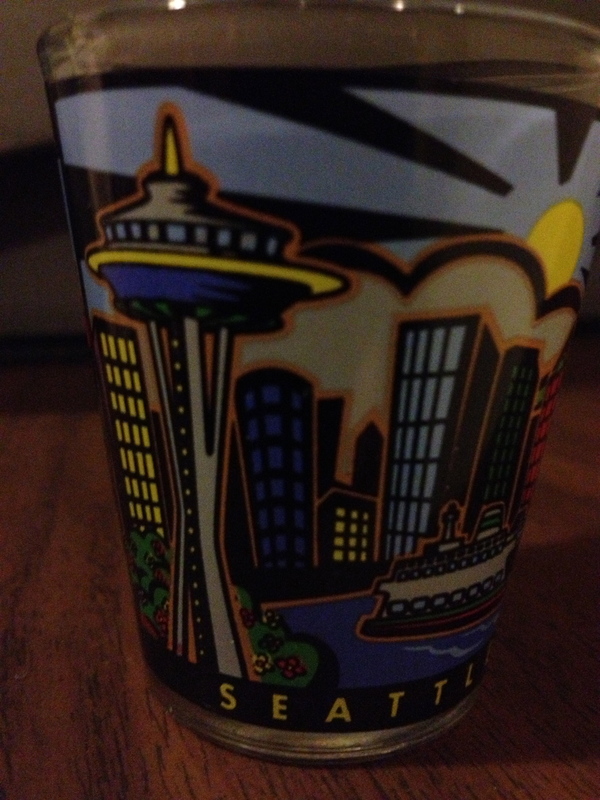 And, of course, our shot glass for each new city that we visit. Since RDA has yet to be implemented, this might sound presumptuous but I’ll throw caution into the wind and just say it: we should move past RDA to a post-RDA cataloging world. This is an idea I’ve been kicking around for several months, having cataloged professionally at ProQuest now for soon-to-be 7 months! Jan. 5th came and went quicker than the 6 month acknowledgment allowed–kinda like those linger holiday thank-yous that I swear Steve and I will write this weekend. Being a professional, rather than a student, cataloging is fully on my mind all the time now. What we catalogers need is a grass-roots cataloging initiative and guidelines. There, I’ve said it. Does it seem radical? I hope the answer is both yes and no. Yes, because cataloging is coordinated and administered, on the whole, by the Library of Congress. Don’t get me wrong, I love them (and would love a job there!! !–as many of us would) yet their purpose is not to be the central conduit and decider of all things cataloging. It just ended up that way because it was nicer and easier for all libraries who happened to have many of the same items and could rely on LC for good records and shelf list cards, subject headings and call numbers. It made cataloging consistent and got items out to patrons sooner since it shared information amongst the cataloging network. So proposing a grass-roots coordinated effort sounds crazy. No, because catalogers truly care about the information and records they provide to the public and their users. Most of the time, a para or a professional cataloger will proof the copy cataloging that is brought in, to ensure quality and make personal adjustments for the library and its collection as needed. LC was never meant, and still isn’t supposed, to be the cataloging aggregate so it makes sense that since the Internet connects us all now, that we catalogers can take back this charge that LC has wonderfully kept in check all these years and reclaim what should be our prerogative, especially now that we have the tools and capabilities to catalog together as a profession. What exactly is the idea that I am proposing? Rather than trying to rush RDA which still seems to be not ready, and with no successor to MARC in sight, as a cataloging community of paraprofessionals and professionals, we should create and maintain our own cataloging wiki that contains all the rules and guidelines, authority files and subject headings, classification and call numbers, that can be edited by any cataloger. We all care about the work we produce. The listservs make this clear. So what if we funneled all that energy and knowledge and experience into a self-created and maintained wiki for all catalogers? So many people complain about lacking and unsatisfactory subject headings, for example, that wouldn’t it be great to have a wiki in which we all give our input and create not only what we need but what the users want? It would remain a standardized list but we as catalogers would control it. AACR2 and MARC are still viable but what we need to do as professionals is start hacking them more–see my previous post. There is room for expansion in the available fields and subfields, as well as indicators. We could repurpose what we need for now and growth for the future, rather than trashing it all for RDA or some other systems that isn’t yet fully realized. If we took over cataloging guidelines and standards, cataloging could become what we want it to be for the current and future needs of libraries and their patrons. We shouldn’t let the past blind us to the capabilities of what we already have and use today. Computers hold far greater quantities of information, so we should put in all the information, fully written out and complete, that we need to explain the item and that the user needs to find it. Sure, AACR2 and ISBD were especially useful for shelf list cards but we can and should expand beyond those restrictions since they don’t apply anymore. Same goes for MARC, it is still perfectly good; it just needs some tweaking to expand it. Sure, this time next year RDA might be officially rolling out and we will all likely be learning it, but what if? What if an idea like mine took off and revolutionized the cataloging world, not in a way we expect by undertaking a new set of guidelines but in a vastly different way of conceiving and maintaining the cataloging world all together, in a collaborative wiki run by us catalogers?